For everyone who just loves the style of the classic Wayfarer but wants an updated look: meet the Ray-Ban New Wayfarer Classic sunglasses. Based on the iconic shape of the classic Wayfarer, these sunglasses have a slightly smaller frame and an eye shape that has been softened just a tad. 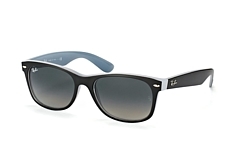 The Ray-Ban New Wayfarer manages to offer a snug and comfortable fit without sacrificing any of the visual clarity or protection for your eyes. 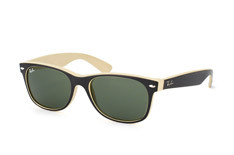 Every now and then Ray-Ban updates their classic and legendary sunglasses models. Models like the Wayfarer which you will certainly have seen many times, worn by the likes of John Belushi and Dan Aykroyd in the cult John Landis movie 'Blues Brothers'. 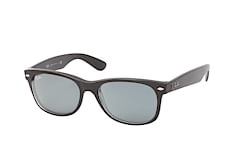 Tom Cruise, Buddy Holly and Bob Dylan all played a part in imprinting the design of these sunglasses upon the collective memory of generations past and present. James Dean started it all way back in 1955. Audrey Hepburn followed suit, Marilyn Monroe and Cary Grant were next. Johnny Depp, Jude Law, Orlando Bloom are carrying on the trend... and the list goes on! The Wayfarer has never gone out of style during its sixty years. With the introduction of the Ray-Ban New Wayfarer, Ray-Ban have created a new and distinctive look: an update of the original, yet unmistakably Wayfarer. The New Wayfarer sports slightly smaller rims and a rounder shape, while staying true to the style of the classic Wayfarer. People will turn their heads when you wear this inspired combo of old and new. 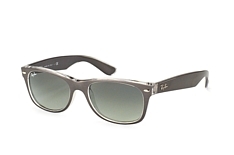 The famous silver applications, the chrome bullets, are still where they belong: at the rims' edges and at the temples, bolted to the hinges. 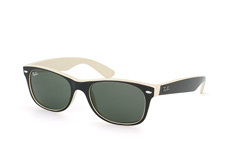 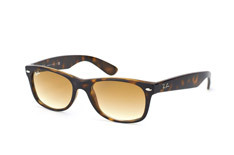 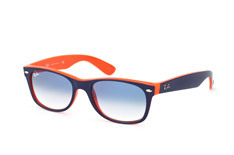 In fact, this feature is so widely imitated that Wayfarers are a style as much as a brand. 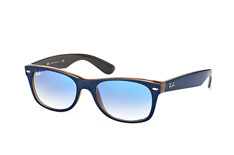 The frame of the New Wayfarer is made of nylon. It is lighter in weight and will sit more comfortably, while at the same time protecting your eyes from the sun. You can pick your lenses from a range of over 30 colours, including some funky combinations of bi-gradient. Almost all the lens colours are available with mirror coating and polarisation. Whenever light is reflected by a shiny surface such as glass, metal or water, it can produce glare that strains the eyes. Polarised lenses filter out most of this glare, reducing eye strain and helping to improve visual clarity, especially when out on the water, ski-ing or driving on wet roads. The New Wayfarer is particularly flattering if your face is round or oval. 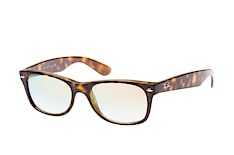 Choose the perfect combination of frame and lens colour and create your very own look to chime with your personal style, all from the comfort of your home. Try on as many variations as you like. The virtual fitting feature of the Mister Spex online store lets you see what you will look like in your new sunglasses. Get the perfect look with a pair of New Wayfarers at Mister Spex. A few mouse clicks are all it takes - all from the comfort of your home.